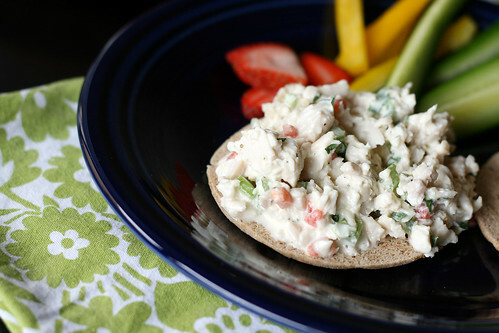 I like my chicken salad sans fruit and nuts and leaning more towards the moist side. How do you like your chicken salad? Years ago I had chicken salad at a party that I fell in love with. Something about the flavor was unique, a little more tangy than a typical chicken salad, but still simple. I really hate it when people try to hide grapes and apples in chicken salad (I know, everyone says it’s good but I just can’t get past the fruit in mayo) so the simplicity of that salad was perfect for me. Unfortunately, it was a family recipe so it wasn’t up for sharing. I thought I detected a flavor similar to coleslaw so I took a little mental note and tucked it away for later. Despite wanting to try my hand at recreating it, it has remained tucked away for several years. Finally last week I decided to give it a go for a simple lunch on the day of my parents arrival to San Diego. After typing the recipe out it appears that I have taken away from some of the simplicity, but it was thoroughly enjoyed by both of my parents, Sean and me. It had just a hint of tang and, due to a greater amount of liquid than most chicken salads, a nice amount of moisture. I served on sandwich thins with a side of sliced veggies and fruit. With a finer chop on the chicken it would also make a nice topping for crackers. Add the egg, lemon juice, vinegar and salt to the bowl of a food processor. Turn on and process. Very slowly stream the oils into the food processor. After adding all of the oil, process another 30 seconds. You just made mayonnaise! Remove 1/2 cup of mayonnaise (place in an air tight container, pressing plastic wrap into mayonnaise) and store for later use. Place the remainder of the mayo in a large bowl. To the bowl add the sugar through the lemon juice and stir to combine. Add the chicken, celery, green onions, pimentos and parsley. Cover and refrigerate for at least 2 hours before serving. * I really liked the flavor the home made mayonnaise with olive oil gave the chicken salad, but if you’re looking for easier prep time you can certainly just use 1/2 cup of store bought mayonnaise. Note: After 3 days in the fridge it was a little runny. After pouring off some of the excess liquid it still tasted great so don’t worry if it appears to be watery after storage.